The fall is the perfect time for curried pumpkin bisque, pumpkin bisque is a hearty and filling soup that makes a great first course, or even a light dinner. This recipe for pumpkin bisque is very easy, a can of pumpkin is used so there is no need to spend hours roasting pumpkin. It isn’t hard to make a simple curried pumpkin bisque, we use a can of pure packed pumpkin to help make this easy. Be sure not to pick up the can that is pre-seasoned pumpkin pie filling, or you will get a very different soup. If you do not have curry at home, I would recommend using cumin, and a little mild chili powder, and it will taste great too. This is an easy and quick dinner, you can have dinner on the table within about 15 minutes. 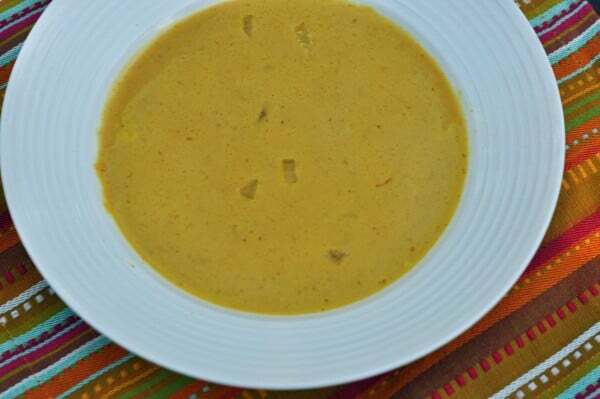 Curried pumpkin bisque is a great way to enjoy the flavor of pumpkin all year around. In a medium-sized pot saute chopped onions and chopped garlic in two tablespoons of butter. Cook until onion is translucent and fully cooked. Add in curry powder, stirring well, cook for about one minute, this mixture should be very fragrant, add saffron strands and stir well. Add four cups of chicken broth, and stir well. Add one can of pure pumpkin and mix until the pumpkin is fully blended. Reduce heat to low, and cook for about five minutes before adding 1/2 cup heavy cream. Season with salt if desired. This tastes wonderful with a little freshly grated nutmeg over the top. This soup reheats very well, so you can make it ahead of time or even pack in a lunch and bring to work. I like to serve this soup with buttered Melba toasts. Can you substitute canned evaporated milk for the cream? Or do you recommend making a light white sauce? I would really recommend using the cream, if you don’t have any on hand, you could try the evaporated milk. I have not tried making this soup using a white sauce. since when is chicken broth vegetarian? Actually it is not from anywhere. This is the pumpkin bisque that I like to make. This looks very warm and comforting. I’m so happy it’s the time of year again for this kind of food. Yum!